It's time for T-SQL Tuesday #78 - May 2016 edition! Plenty of heads-up for this installment of #tsql2sday because this time, I'm challenging you to learn something new and blog about it! There are so many new things to play around with, some brand-spanking newly released, and others that have been around for a bit, but you've probably still not taken any time to try it out. Your post must be published between 00:00 GMT Tuesday May 10 2016 and 00:00 GMT Wednesday May 11 2016. Include “T-SQL Tuesday #78” in your blog post’s title. 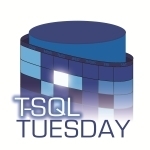 Contact Adam Machanic and tell him you’d like to host a T-SQL Tuesday from your blog.